Independence Day is Friday, July 4th, the bakeries are observing the holiday and their offices will be closed on Friday. Our office will be closed on Friday and Saturday as well. If the holiday effects your operating hours and/or you have a regular standing order that you do not want delivered, please notify customer service by Tuesday, July 1st, 4:00pm. Late orders and cancellations will not be honored by the bakeries on holidays. They will not change or fill them, so please plan ahead. Deliveries will be made everyday as usual. Pulverize your dry St. Patty’s leftover bread in a food processor. Add chopped dill, soft butter, honey mustard, and horseradish. Use to crust your: Irish Salmon Filet, Rack of Lamb, or Beef Tenderloin. Chefs, cooks and operators spend years developing and perfecting their concepts of the "Perfect Burger." Creations include a very specific mix of custom blends with local butchers or preferred vendors, and have to take into consideration fresh vs. frozen meat, protein: fat ratios, density/texture of the grind, flavor development, component combos, cooking methods and techniques, yield testing of raw vs. cooked weight, the diameter, weight and height of the meat, and countless other deliberations. After the meat of the meal has been carefully chosen, they consider bun selection; using an inferior bun can ruin all that hard work . 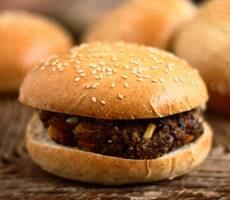 It is the #2 factor determining if a burger is quality and satisfies the customers burger experience. http://www.seriouseats.com/talk/2008/07/hamburger-bunswhats-the-best.html reveals many different opinions and tastes regarding the perfect bun for the "perfect burger." Some like a plain white bun and don't mind any sogginess or drip, some like a potato bun to give their burger a little added flavor and texture, some even prefer unusual choices such as sourdough or a kaiser! And if you need any further assistance in making the best choice for your burger, our Customer Service Team and Corporate Chef can assist you to match the optimum bread for your perfect Burgers; We've got height, diameter, weight, density, seeded, unseeded, white, wheat, artisan or commercial production, packaged, Kosher, semolina, sourdough, ciabatta, potato, brioche, pretzel, kaiser, white, wheat, soft, slider and appetizer sizes, crusty and fresh options in our inventory. We have your Perfect Burger covered! Royal Bakers distributes good/better/best products to fit your food cost projections, recipe specifications and service concepts. Please browse our website for your considerations. Probably the most famous place to get a cheesesteak sandwich is still Philadelphia, where the sandwich originated in 1930. Two rival shops in particular produce this specialty, Pat's and Geno's, and they both make them pretty much the same way. On a long roll, much like an Italian sub, they pile sauteed beef and melted cheese - usually Cheese Whiz, but sometimes American or Provolone. That's really all there is to it! 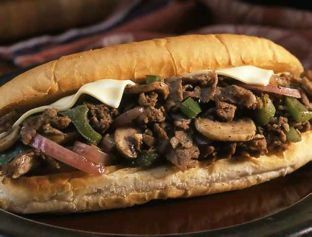 Of course, other toppings can be used, such as peppers, onions, condiments, and even lettuce and tomatoes, but, in my opionion, the key to a great cheesesteak sandwich is the roll that holds all those juicy ingredients. If you ordered a cheesesteak sandwich and was given a pile of drippy, melty, cheesy steak in the center of two slices of Wonder Bread, you'd know something wasn't quite right. That's because you know, for such a hearty and mouth-watering treat, you'd need a great roll to handle those drippings. It would need to have a little density and a crusty shell to soak up all that goodness while not being chewy or tough, and long enough to hold comfortably in hand, giving you the benefit of a mobile meal. I'm not sure which exact roll Pat's or Geno's uses, but we have a few options that work perfectly. The 6", 8", 10", and 12" club rolls from Rockland Bakery, the Cuban Hero from Hudson Bread, the Italian Hero 12" from Settepani: all of these rolls have just the right amount of crust and density, which is perfect to work with that "drip factor" that is so important to the original Philly Cheesesteak Sandwich, and can easily be held in hand for portability. Not unlike a muffaletta, the bread soaks up the juices and cheese without soaking through the bread, and that makes everyone happy! Interested in reading more about the Philly Cheesesteak origins or the rivalry between Pat's and Geno's? Check out this link: http://www.visitphilly.com/restaurants-dining/authentic-philly-cheesesteaks/. What in the world is a muffaletta? 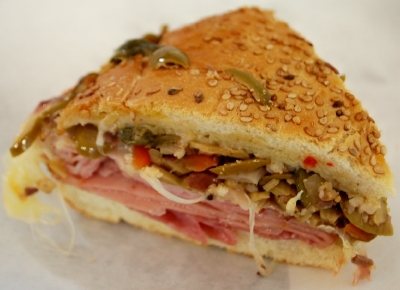 Serious Eats describes the muffaletta as: "a world-class sandwich which hails from New Orleans, where it is often sold as an entire loaf of bread suitable for four people of healthy appetites to enjoy." I think I'm going to need a plane ticket to Louisiana. If you've never had a muffaletta, here's a bit of background. It was brought to New Orleans by the Italian community and so it's packed with meat and spice. Not unlike an Italian sub, the muffaletta has layers of meat and cheeses which are paired with peppers, capers, olives, or anything with enough zest to offset the meat. And, because it's so versitile, any ingredient will work depending on the chef! But what really makes this sandwich is the bread. It's almost impossible to find great muffaletta bread outside of New Orleans, but we can find you some pretty close options to compare to the real thing. What you're mainly looking for is a thick focaccia-type to soak up all the great flavors from the meat and cheese. (We've heard the longer it rests, the better it tastes!) We have an abundance of focaccia and ciabatta breads, ranging from large sheets to individual round sandwich roll sizes, from heroes to baguettes. One great option that has been featured at Beauty & Essex is the Ciabatta Sandwich Roll from Balthazar Bakery. The Chef at Beauty & Essex uses the ciabatta because it's thick and rustic, just like the bread used in New Orleans, but scaled down to satisfy one individual instead of 4. The pockets throughout the ciabatta help trap the flavor from the sandwich ingredients and also help the chewer not wear his jaws out. Is your mouth watering yet? If you've opened your eyes or ears at least once this past week, you'll know that there's a sudden surge in the pretzel bread industry. Wendy's Pretzel Bacon Cheeseburger, Dunkin' Donuts' Pretzel Roll Roast Beef Sandwich are only two popular options you may come across. But it's not only the fast-food chains that are adding pretzel bread to their menus. 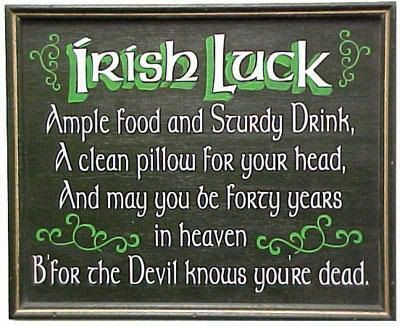 Many restaurants, taverns, bars, and delis are also joining in! The craze seems to be based on savory, spicy, and creamy ingredients in between a crusty yet soft, salty bun. There are numerous flavorful combinations to pair with the salty pretzel besides cheese and meat, however. Many sandwiches on a pretzel bun have included avocado and even chicken salad! Let's face it, there are so many different sandwich ingredients you can throw in between two slices of pretzel, so many creams or sauces you can spread. It's a favorite for any kind of sandwich eater! Dare we say, a staple bread? Delicious ingredients that we've seen between the buns include: honey mustard, white cheddar cheese, avocado, applewood smoked bacon, dijon mustard, chili, ham & swiss, BLT, chicken, tuna, crab, turkey, and eggs. There's a ton of creative combinations out there, we'd love to hear the tasty treats you'd like to create on your pretzel buns! Check out Royal Bakery's full line of pretzel products, TomCat Bakery's pretzel burger buns, or Hudson Bread's pretzel dinner rolls for sliders or a hearty soup side. A popular item among our customers is the salted pretzel stick from Bakery of New York. Anyone been to an Oktoberfest this season? We bet you've seen pretzels there. They're perfect to pair with beer! Coming Soon! Look here for ideas and inspiration. Thinking of trying a new bread but not sure what to make? Check-in here, we'll do the research for you! Welcome to the new Royal Bakers website! We have redesigned our website to provide our customers with the best service possible right at their fingertips. Royal Bakers offers new and exciting features to ensure we deliver the very best service we can.